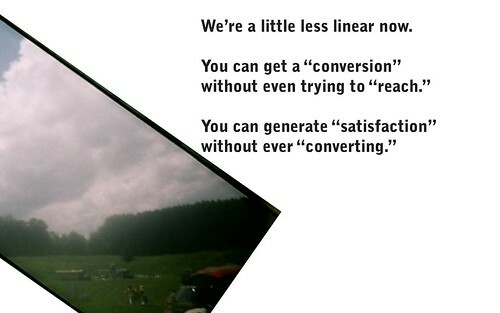 We can get a conversion without even trying to reach someone. For example, our social media contacts can be working on our behalf when we didn’t ask them to–selling our services because they just like what we do. You can also generate satisfaction without ever selling anything to someone. They might just like what you’re doing and start telling people about it. This creates positive chatter about you or your brand. Using social media it starts to become clear that there are two kinds of really important people out there: the people who can be our customers–we need them to generate revenue and keep the doors open. And then there’s the people who say nice things about us. These people help extend our reach as well as encourage acquisition and conversion.